The 18-hole Blue at Wigwam Resort (formerly known as Patriot) in Litchfield Park, Arizona is a resort golf course that opened in 1965. Designed by Robert Trent Jones, Sr. , Blue at Wigwam Resort measures 6000 yards from the longest tees and has a slope rating of 123 and a 69 USGA rating. The Estrella and White Tank Mountains border Falcon Golf Club in Litchfield Park, providing beautiful views from almost every hole. The public course has a classic, player-friendly design that is still challenging enough to appeal to more advanced players. Its playability makes the golf course a popular venue for tournaments. 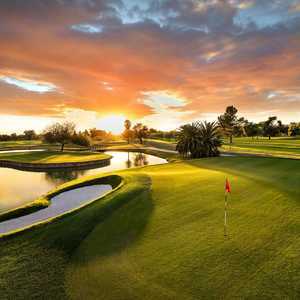 The 18-hole Gold at Wigwam Resort in Litchfield Park, Arizona is a resort golf course that opened in 1964. 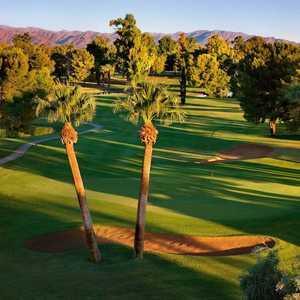 Designed by Robert Trent Jones, Sr. , Gold at Wigwam Resort measures 7345 yards from the longest tees and has a slope rating of 132 and a 74. 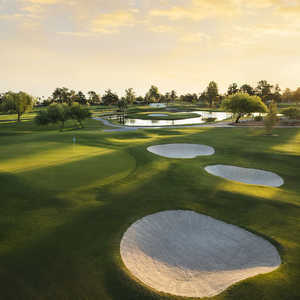 The 18-hole Red Course (previously known as Heritage) at Wigwam Resort in Litchfield Park, Arizona is a resort golf course that opened in 1972. Designed by Red Lawrence, Red at Wigwam Resort measures 6852 yards from the longest tees and has a slope rating of 124 and a 71.